Make these breakfast egg muffins as a perfect grab-and-go high protein breakfast (or lunch, too). 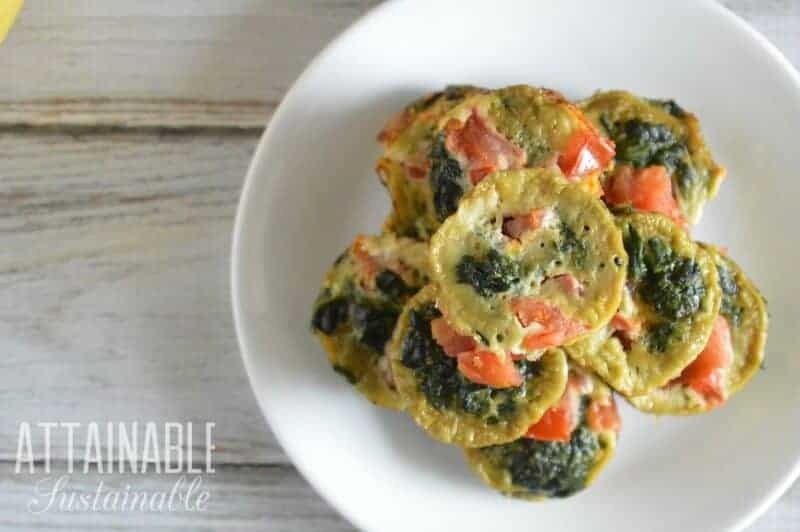 With endless variations, these healthy egg muffins fit well into a low-carb, paleo diet, and depending upon the additions, can be made vegetarian as well. As soon as the days begin to get longer, the egg boxes around here start to get a bit more active. When we have plenty of eggs (or more than plenty!) I like to utilize them as much as possible. After all, they’re produced locally. 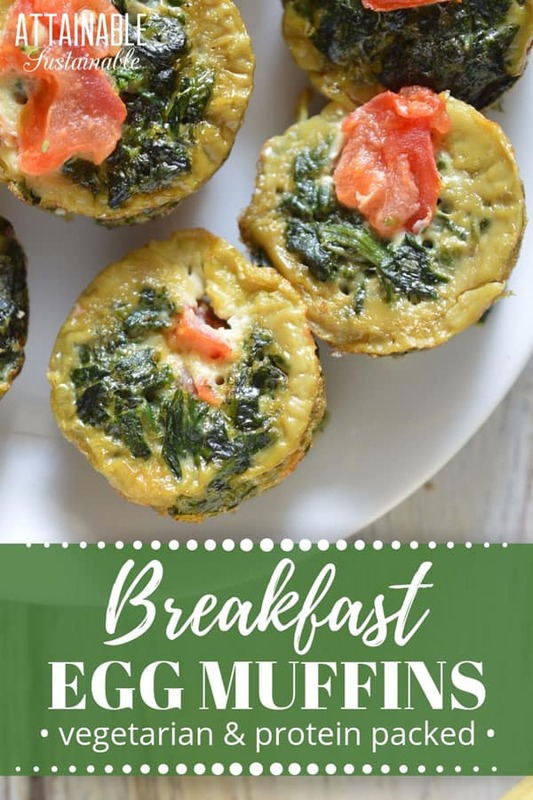 These healthy egg muffins are easy to make, but better yet, easy to grab when we need a quick breakfast or snack on the run. Breakfast egg muffins have become quite popular these days as people embrace low carb eating. For us, it’s more about “using” what we have. And when what we have is a pile of fresh eggs, these breakfast egg muffins are a great way to serve them up. This egg muffin recipe is so flexible! Once the base is assembled, change up the flavors to suit your mood or to use up what you have on hand. What I love about these healthy egg muffins is that I can make up a batch (or a double batch) and have a ready-to-grab meal or snack. Saving time in the kitchen means it’s more likely that I’ll cook from scratch. If you, too, feel like there are not enough hours in the day, prepping meals like these health egg muffins ahead of time is a great trick. Bonus: It will save you money at the checkout, too. 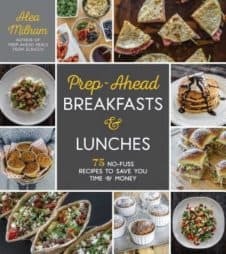 I love Prep-Ahead Breakfasts and Lunches by Alea Milham. In it, Alea offers up 75 mouth-watering recipes that can be made ahead, then reheated for a quick breakfast, lunch, or snack. 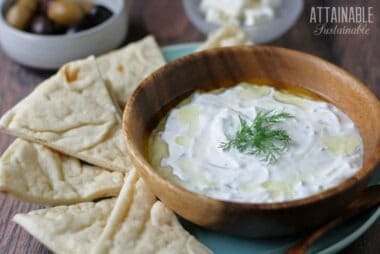 Recipes like Tuscan pork quesadillas, ratatouille grilled cheese sandwiches, and buffalo ranch chicken soup come complete with instructions for making, storing, and reheating these meals. 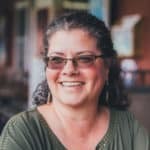 Make a double batch of any of these recipes, serve it at mealtime, and then use Alea’s guide for storing the rest for a rush-hour breakfast or lunch on the go. 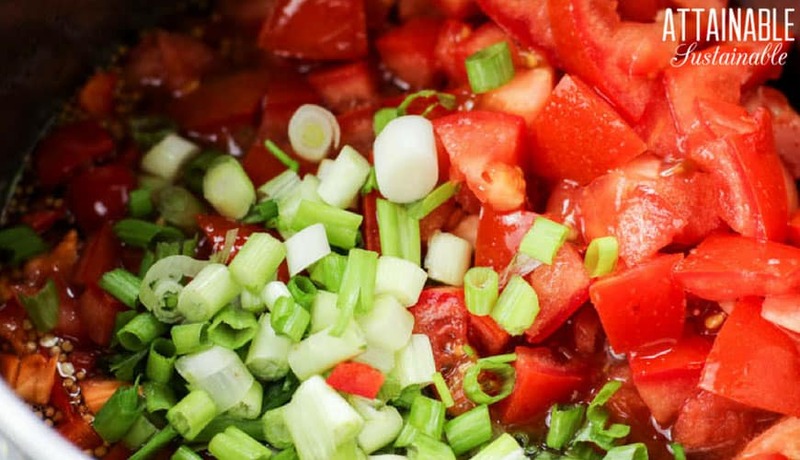 Prepping meals in advance is a game-changer if you’re trying to cut back on store-bought prepared foods. ★ Did you make these healthy egg muffins? Don’t forget to give it a star rating below! These vegetarian egg muffins make a perfect grab-and-go high protein breakfast. While I've included instructions here for several flavors of egg muffins, this recipe is endlessly adjustable -- experiment! Preheat oven to 375 degrees F. Coat muffin pan liberally with olive oil. Heat olive oil in a large frying pan. Sauté spinach in olive oil until it's wilted. 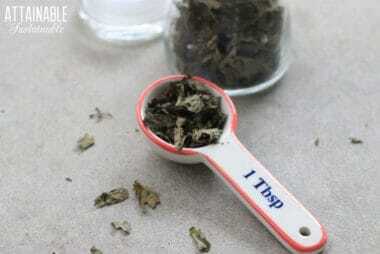 Put cooked spinach into a mesh colander and press with the back of a big spoon to remove liquid. Alternatively, wrap cooked spinach in the center of a dish towel, and squeeze excess liquid out. Beat eggs, garlic, salt, and pepper in a large mixing bowl. Stir spinach into egg mixture. Add vegetables or other variations (see below) and stir to combine. Add egg mixture to each oiled cup, ¾ of the way to the top. Bake for 8-12 minutes until set. Let cool. Run a knife or spatula around the edge of each muffin to loosen and remove from pan. Dice 1-2 medium sized tomatoes; stir into egg mixture. Stir 1/4 cup of diced kalamata olives and 1/2 cup feta cheese into the egg mixture. Stir 1/4 cup of crispy cooked bacon bits and 1/2 cup cheddar cheese into the egg mixture. Stir 1/2 cup finely chopped broccoli and 1/2 cup cheddar cheese into the egg mixture. Cook 1 cup of sliced mushrooms along with the spinach. Stir 1/4 cup each of pesto and parmesan cheese into the egg mixture. Add one clove diced garlic to spinach while cooking. Stir 1/3 cup diced sun-dried tomatoes into the egg mixture. Stir one diced tomato, several kalamata olives, 2 sliced green onions, and 1 clove of garlic (diced) into the egg mixture. Note: I received a copy of Prep-Ahead Breakfasts and Lunches for review purposes. I’m definitely going to make these again!